The council has opened two cold-weather shelters for rough sleepers in Worthing today as freezing temperatures hit. The shelters have been opened today (Friday, January 18) and are expected to be open for three nights – though the council said staff would monitor the situation with a view to extending if necessary. The service is provided under Severe Weather Emergency Protocols (SWEP), which recommends that shelters open when temperatures are zero degrees or below for three days or more to prevent loss of life. 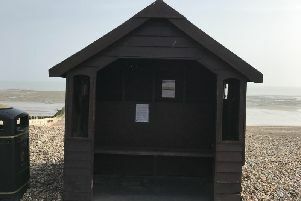 Expert teams from Adur and Worthing councils and the charity Turning Tides will staff the shelters. It is the second time this year so far that the emergency protocol has been rolled out in the area. Businesses and residents are also encouraged to play their part to help any rough sleepers. - Connecting rough sleepers to local support services via the Streetlink app. These reports are checked and responded to by Adur and Worthing Councils Outreach staff and Rough Sleeper Coordinator. A council spokesman said: “We are dedicated to making sure vulnerable people on the streets are cared for, not just in extreme weather, but throughout the year. “Our dedicated team of outreach and support staff are out every day and will ensure that all those in need are directed to a dedicated shelter during this cold snap. “At the moment, it is predicted that the shelters for Adur and Worthing will be opened for three nights but we will continue to monitor the situation. Funding for the cold weather shelter and other outreach services comes from a government grant which ensures the councils can continue offering vital support until the spring of 2020.